In this article, we are going to learn about batch processing. What is it and how to implement batch processing system in java? 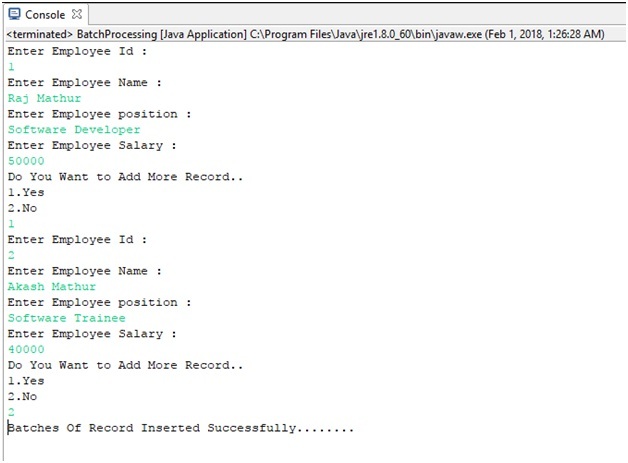 Batch processing in java is used to execute a group of queries or a batch as executing single query again and again is time taking and reduce the performance. Thus, using batch processing multiple queries can be executed at once. This increase the performance of program. Batch Processing can be done by using statement and prepared Statement of java as these two statement provides batch processing methods to process the batch. void addBatch(String query) : this function adds query into batch. int executeBatch() : this function executes the batch. Let’s take an example to see how batch processing is done? Here, we are taking an example of employee table where we will insert multiple field values of multiple employees. Step 1: First, you need to create a database table inside SQL name it "employee" and the following fields in it. Step2: Make a class named "BatchProcessing" in eclipse.